Here comes the sun, what a beautiful day! Our adult miniature Zebu Beauregard, using ZZ Topinha, one of our baby bottle fed Brahmas as a pillow. Two years ago today (November 13th, 2007) a small kiss changed my life forever. Funny how two people can know each other for years, live parallel lives, run in the same circles, share many of the same friends and not realize that they should have been together all along. But then came a kiss and the deal was sealed or as he would like to say...we pitched some woo and the deal was done. I had no idea that pitchin' woo could be so wonderful, considering I thought he was referencing a barn activity (and looking back now, I guess it actually could be..hee...hee..hheeeee). I never thought that two years later, we would be living on the farm and settling down into a life of love, laughter and finding the little things in life are what is most important. He is the best thing that ever happened in my life and I thank my lonestars every day. Four nights away from the farm and my cowboy have made me realize how much I have grown to love my new rural life. The city life is no longer an option, I cannot wait to go home. I miss the clucking of the chickens, the mooing of the cows and the sweet nuzzles and waffling that the little donkeys like to greet me with whenever they see me. Most of all, I missed my cowboy. I missed drinking coffee in the morning and contemplating the day based upon the weather outside. I missed having lunch together, we make it a habit to drop what we are doing and meet for a bite to eat at the old kitchen table or in town at the museum I curate. Most of all, I missed our evenings together tucked away snugly in our little farmhouse, just us and the four dogs and two cats who share the same little four square at night. It's funny where life takes you and who it throws in your path. Like I said, we had known each other for years - before we REALLY knew each other. I think I knew somewhere deep inside that we loved each other right there and then on that fateful night of November, 13th. So 13 to us is a very lucky number indeed, so lucky, that we made it permanent - in ink, on Friday the 13th no less. So, the question is now - what are we doing next year? Shutterbug: Have you kissed a chicken today? The old saying "a picture is worth a thousand words" really resonates with me. I am old school and prefer a real camera over my telephone one, so I actually carry my camera wherever I go. This makes for a sore purse shoulder but the additional weight in my little black bag (or whatever else I am carrying that day) is well worth the muscle pain. 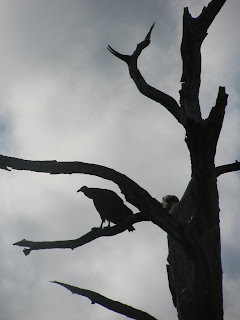 I have decided to share glimpses of our life through our photography (mine and my artist cowboy) whenever the shutterbug bites us. Sometimes they might make you laugh, other times they might make you smile and some may transport you to the farm, if only for a minute. What is better than looking at Folk Art? 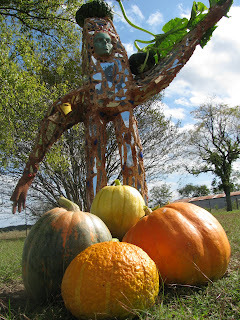 The answer is Folk Art that you can look at and then eat! Up to this point in my life, I always considered cooking as my artistic expression. Now I have found a way to combine my love of cooking with my love of folk art. By definition, Folk Art is a result of ordinary people expressing themselves through their creation and construction of utilitarian objects that convey meaning and value to themselves and to others within their culture. A Folk Art object's final form often carries a certain beauty that elevates ordinary objects into the extraordinary. This year for Halloween, we decided to go as Dia de los Muertos sugar skulls. To complete the look, we decided to make edible sugar skull cookies to pass out to party guests. My artist cowboy is well known for his zany, whimsical visionary art and I'm known for creativity in the kitchen, so this seemed like a perfect match. I have said this before and will say it again, I am not a baker by choice. I love to cook and create savory dishes and cakes, cookies and desserts have never been my strength. But it's time to push the envelope, think out of the box, get the old KitchenAid mixer off the shelf and just go for it. I went in search of the perfect cookie recipe and found a beautiful website called Sweetopia.net, I only hope to be as half as creative as Marian (the Sweetopia blogger). Her blog has great tips, artsy themes and I consider her a true cookie folk artist! So I tip my cookie decorating squeeze bottle to her. Cream butter & sugar until light and fluffy, add eggs one at a time and continue to beat. Slowly add each extract flavor and cream till blended. Put dry ingredients through a flour sifter and blend well. Mix dry ingredients with creamed ingredients a little at a time until the dough comes together. **Culinary Tip** Roll out your sheets of dough between parchment paper and stack in refrigerator on a cookie sheet. This eliminates the step of adding more flour and rolling after chilling. The cookie dough will be ready for the cookie cutters in 1 hour, once chilled in the fridge. This recipe made about 5 rolled sheets (about 50 cookies). Heat the oven to 350 and allow to heat for one hour before placing the cut cookies in to bake. Bake the cookies on parchment paper till light brown around the edges, about 8 -10 minutes. Cool on racks. Hand mix the warm water with the meringue powder till blended and frothy . Add cream of tartar and hand mix another 30 seconds. Pour in all the sugar and mix gently by hand. Using an electric mixer, blend with a paddle attachment on lowest speed for 10 minutes (yes, 10 minutes - the frosting will become silky smooth and shiny). **Culinary Tip** Cover the bowl with a damp cloth and take out small amounts as you go to blend with your food colorings. In this case for the skull cookies, I used a lot of white icing and made black icing using red, blue and green food coloring. The other color accents (red, yellow, green & blue) on the cookies were very easy to do with culinary decorating pens (purchased in the baking aisle at the local grocery). They are really easy to use, just do not press down too hard or they crack the icing and ruin the tip. Pick out your base color for your royal icing frosting. Make sure your cookies are completely cool before icing them. Place your base color in a squeeze container with a thin tip ( I buy them at a restaurant supply store). Outline your cookie, the outline will act as a dam. Allow outline to dry. Add a little warm water to your frosting bottle to thin the royal icing. Flood the surface of the cookie and evenly spread within the dam. I use the bottle tip to do the spread the inner icing. Once the cookie has a nice even layer of icing, allow to dry and harden before adding other color. For the skulls, we took our black icing and made the eye sockets, noses and jaw/teeth outline. Once the black had dried, we then began decorating the skulls with unique patterns, using the culinary pens. The final touch was to outline the entire cookie with black icing for a more dramatic effect. Be creative, do not be afraid to experiment. Just like true Folk Art, there are NO rules!! I named this recipe in honor of Marcel, my sweet beloved rooster who had a brief but happy life here at the farm. By now, you probably know I grew up in Brazil. Many Brazilian desserts have eggs as their primary ingredient. Portugal's influence is evident as they are known for their beautiful and tantalizing egg custard desserts. I grew up eating pasteis de nata (little custard pies). According to Portuguese legend, two nuns invented these lovely little custard tarts and the recipe only became known to the public around 1837 when some entrepreneurial monks decided to open up a bakery shop to help fund the building of a new monastery. I love those tarts but enjoy just as much the plain variety of just pure custard.I remember my very Texan mother & grandmother making wonderful little cups of egg custard desserts when I was just a toddler. Whenever I see a ramekin, it triggers a strong memory of savoring a little cup of creamy, yellow sweetness while sitting at the kitchen table with my mom or grandmother cooking nearby. Beat eggs slowly with mixer one at a time until creamy golden. Add syrup, vanilla, sugar and continue to beat. Slowly begin adding milk and blend gently until completely mixed. Pour egg mixture into oven proof ramekins or small decorative baking dishes. Sprinkle with cinnamon and nutmeg. Place them in a deep baking pan that can accommodate all the ramekins. Fill the deep pan with enough water to keep the custard from burning (about halfway up the ramekin). * If adding fruit, check custard 25 minutes into the cooking cycle and if soft set, add the fruit artfully on top sprinkle with sugar and then continue to bake for remaining time. August was a busy month on and off the farm. I took the month off from the blog but here is a quick update to bring all of you up to speed. We have more calves, less roosters (coyote trouble), lost our heirloom garden to a hail storm, learned to make soft and hard cheese at Homestead Heritage, wrote an article for Grit Magazine, stayed at the haunted Faust hotel, graduated from the Mid America Arts Alliance year long program, tubed down the Guadalupe, attended a Town Hall meeting & entered a baking contest. But there was one event that was more exciting than all the others - we found an EGG in the chicken coop, then one on the ground, then several more in the art studio and now everyday is like an Easter egg hunt. The first egg finding was touched with happiness and sadness at the same time. I was grieving the disappearance of my absolute favorite rooster, Marcel. I had refrained from naming Marcel for almost 6 months (from the day, the chicks were a day old). I was told not to name the chickens because "chickens are always looking for a way to die" and to not get attached. Marcel made that very hard. He was different than the rest. From the time he was just a chick, he acted more like a dog than a chicken. He loved to be picked up and petted and would run across the barnyard as soon as he saw me walking up or parking the car at the gate. 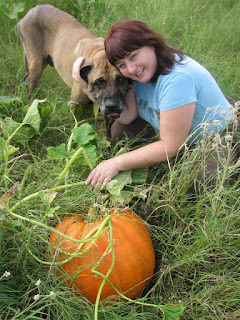 Marcel made my morning and afternoon rounds around the farm with me. He watched as we fed the calves, worked in the garden or played with the donkeys. He crowed with happiness when sitting on the swinging bench. He was always at my heels and he made me laugh every day. His freedom was part of his happiness. I named Marcel after another rooster who became close to my heart. This Marcel happened to reside near downtown Austin. He sort of belonged to my best friend. She adopted him when he showed up in her yard. He had a happy life till a predator ended his too. We think the predator was a UT law student who grew tired of hearing Marcel's beautiful wake up call. My Marcel and another of our roosters did not show up at the coop for sundown lockdown. I knew something had happened, he was always at the coop first, calling the other chickens and Guineas to settle down for the night. I was distraught, we looked for him in all of his favorite places but to no avail. I held out hope that he and the other rooster might have wondered a bit too far but would find their way back. The next morning to my surprise, our missing black & white Polish rooster who was MIA with Marcel, was sitting atop the coop. He must have been in hiding after his buddy Marcel got attacked. Marcel never returned, but the coyote who we suspect killed him did. The coyote showed up for two nights straight. My cowboy sat in wait for him with his hunting rifle. He didn't kill him (could not get a decent shot), but scared him enough that he has not come back. The day after Marcel's life ended, a new surprise was there to greet us in the coop. A perfect white egg still warm from being laid was deposited on the ground. Our chicken adventure had come full circle. For my birthday, my cowboy took me over to Canton First Monday Trade Days. We thought it would be an adventure to experience this market place that has been setting up under the old oak trees for over 100 years. It started out as a place where people traded their animals and hunting dogs and has grown into 10 miles of open air and covered pavilions selling everything from Mexican folk art to antique doorknobs, candles to cheesy rhinestone flip flops, alpacas to pot bellied pigs. My cowboy had been coming here since he was a little boy, his grandfather spent most of his life raising fox and raccoon hunting dogs and taking them there on occasion to sell or trade them. We walked through Dog Town where all the animals are sold in Canton and I grew sad as I saw the conditions of how some chickens, Guineas and roosters were raised. It looked like many of them had never experienced one day of freedom. I began to think about my chickens back home, happily running around in the pastures and barn, chasing bugs and each other. I began to realize that Marcel had a wonderful life for a rooster, even if it was brief compared to some of these poor birds. So it was no surprise then, that for my birthday, I picked out my own present. I am now the proud new owner of a refurbished chicken nesting box. Out of all 10 square miles of everything under the sun, all I really wanted was that nesting box. My cowboy laughed about it but gladly picked it up and stuffed it in the SUV. We even celebrated by ordering some Ameraucana chicks that lay beautiful blue and green eggs naturally. Now everyday next Spring there really will be an Easter egg hunt. I finally realized that it wasn't just my chickens who had nested on this piece of Texas landscape but also myself...I look forward to every sunrise and sunset here on the farm with all the joys and sometimes sorrows of each and every day. I never want to leave this nest. And who knows, maybe there is another rooster like Marcel just waiting to be hatched someday, right here at Feed Me Farms. 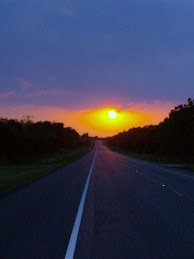 Texas has over 150,000 of surface roads (well, that is according to Wiki), and we always seem to take the ones that have been less traveled. We like it that way. We are so lucky to live in a state that encompasses it all. 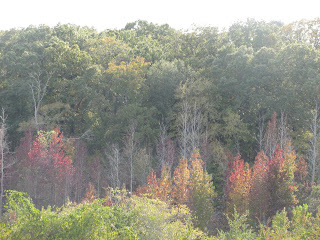 Go East, we have the great Piney Woods. Go South, we have the great Gulf Coast. Go North, we have the prairies and lakes. Go West, we have the wide open spaces and the gateway to the last frontier. I really love each direction and never grow tired of hitting the road for a day or two. This particular trip led us to Buffalo Gap, one of the last places that the mighty buffalo roamed. I had to go there on museum business but as always, I try and make it a nice getaway for a day or two from the farm routine. My cowboy artist, always up for an adventure, eagerly mapped out the most scenic route. The night before our trip, wild weather once again struck the farm. The storm began rumbling right before midnight and by 3:00 a.m. I was wide awake and fumbling for flashlights. By 5:00 a.m. myself, my guy & our four dogs were riding it out in the closet while the cats had to stick it out in the other room (they get their own closet). Two hail storms and one, possibly two tornadoes later, we emerged unscathed only to find that our property had not fared as well. The reason for no power was because two electric poles were now almost horizontal to the ground. The light pole that is located by our water source was now wrapped around the pump station like a tongue tied cherry stem,this solved the no running water mystery. Several of our old oak trees were sheared off at the top and their trunks and branches lay all over our cross fencing. One old shade tree in our front yard split completely in two and it was dangerously close to taking out our security fence around the farm house. The heirloom garden was completely devastated and my beautiful okra and tomato plants which had given us such a bounty, were now laying forlornly on their sides all battered and beaten by the hail. The barn and art studio lost more of their roofs (we had not replaced them yet from the last bout of wild weather) but at least all the barnyard animals were safe and all accounted for. We came very close to canceling the trip but the thought of an all expense paid for beautiful bed & breakfast WITH electricity and running water was just too good to pass up for the night. We thought long and hard about it but in the end, we made our decision. My knight in blue jeans got out his chainsaw and began chopping furiously as I scrambled to pack and get the animals secured for a 24 hour period. Without a backward glance (almost, I did have to check and re-check all our pets and livestock) we took off down the road, as we knew that a good nights sleep awaited us at the other end...so what if it was half way across Texas and we would have to be back by the next evening and tackle all the storm damage that awaited us. One thing I have learned living here on the farm....NEVER pass up a chance to change up the routine and the work will ALWAYS be here waiting for us when we get back. The other thing I have learned is to always take the road less traveled...you never know what you might see, and , you have a better chance of seeing it if you are on a two lane road instead of a super highway! We have had quite a week and I apologize for not posting sooner. We had the three major F's happen - the fair, two funerals and a family reunion. All involved the big fourth F - food! I can honestly say that many chickens (not mine) were sacrificed for these three East Texas rituals. Believe it or not, we had fried chicken at all four events. We also had plenty baked ham, fresh corn pudding, barbecue brisket, corn bread, purple hulled peas, homemade tamales, cakes, pies and lots of homemade ice cream. All of these F's lead up to another F - Fat!!! We may need to add just one more F to the list this next week...fasting! There is something very comforting knowing that the County Fair happens every year the third weekend in June. 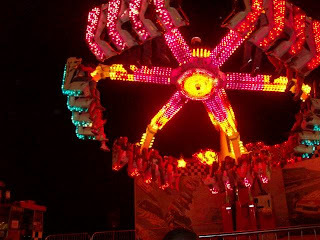 The fair celebrated it's 89th year in 2009. This is only my second year to attend but with every year that passes I get more involved. This year I entered some photographs in the home economics competition. The fair always kicks off with a large parade. The parade floats are elaborate affairs that locals work on for months. Every year there is a different theme, this year was "Country Paradise". There were a lot of grass skirts and cowboy hats (now that's a combination). There were also plenty of duded up horses, tractors, motorcycles, all terrains, golf carts and antique vehicles. Have I mentioned that my cowboy happens to be a well known art car artist? Well, he is. He has been making art cars since the 90's. The "Yellow Rose of Texas" is a 1990 Cadillac that is covered in rhinestones and depicts famous Texas icons such as bluebonnets, longhorns, oil derricks, the Alamo and of course lots of yellow roses.He made this particular car for his mother's 60th birthday (over ten years ago). It took over 400 hours and 10,000 rhinestones to create. 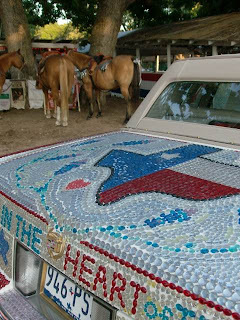 This is by far, one of the most famous of all Texas art cars. It has won the Houston Art Car Parade and has been featured on shows such as CNN, Good Morning America and CBS Sunday Morning. It has graced the pages of Texas Monthly, Heritage Magazine and Texas Highways. It was on the cover of the Austin Travel Guide. The "Yellow Rose of Texas" garnered so much attention that it was chosen to be in the "It Ain't Braggin' If It's True" opening exhibit of the Bob Bullock Museum at the Austin State Capitol. It proved to be the most popular item in the museum. It was invited back twice and has a real place in Texas memorabilia. Now it is on permanent exhibit at our local County museum (which I happen to be curator)instead of just being stored in the barn and we drove it in the parade as the museum entry. It is always a huge crowd pleaser! The kids all call it "The Bedazzled Car". The parade winds it away around the old downtown square and courthouse, then goes straight down Highway 84 (which they close for the event) and ends at the fairground. It is amazing how many people stand in the Texas summer heat to cheer on their favorites. The sense of community really comes alive at this moment. Many of the first settlers of the area have permanent camp sites at the fairgrounds and spend the preceding week decorating them with different themes. There is anything from feed sack, horseshoe and chili pepper motifs to patriotic themes that represent Texas. There are even a few confederate flags that fly, after all this is Texas, and the fair grounds are actually the Confederate Reunion Grounds. 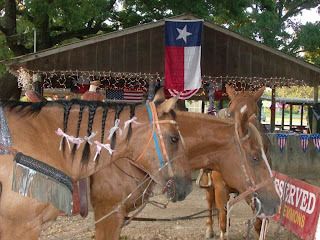 Usually, we spend the entire week enjoying the animal judging events, concerts (Country, Bluegrass & Gospel), rides, food booths, cow patty bingo and the rodeo. Our camp has one of the best locations, it's right across from the concert pavilion, and at the gateway to the food booths and the Midway. All of my cowboy's friends, family and town characters stop by. We end the weekend with a family reunion and a late night at the camp telling tall tales and sharing a bit of days gone by. This year was a little different as two members of my cowboy's family passed away during the festivities. It was a blessing for both. His grandmother was 93 and had been in a nursing home for many years, his eldest cousin had been ill for several years and her quality of life had been greatly diminished. Both funerals were a celebration of life with lots of family, food and friends who gathered to pay their respects. His grandmother (Memaw) was the best beautician in town and owned her salon for over 40 years. Everybody knew her, including the young funeral director who handled the arrangements. He added a photo to her photo montage of him as a baby, getting his first hair cut and Memaw was giving it. He was sitting on a two by four across the barbers chair because he was so tiny. My cowboy said , he too, remembered that two by four well. It was a touching moment and made me think how wonderful it is to live in a place where your life and death can touch so many. She was buried beside her husband in the family cemetery that was started by his family in the early 1800's. Memaw's favorite treat was homemade ice cream. Even in the nursing home, we always gave her a bit of soft serve ice cream after her meal. Before her body faltered and her memory faded, Memaw made homemade ice cream all the time for her three daughters and her grandkids. Grandad and Memaw would make them homemade peppermint ice cream and they would have a good old ice cream social. My parents and grandparents would make hand cranked ice cream for us every summer too. I can still remember the old wooden ice cream maker with the ice and bags of rock salt, later on they got an electric one but it still had the wooden barrel. It was a White Mountain brand, which has been around for over a hundred years (although I think Rival owns them now). 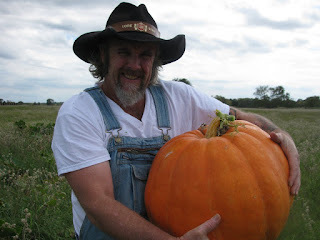 I may be adding one to my farm wish list for future fair use. Both my mom and grandma were awesome Southern cooks and they would make us homemade custard ice cream, this process involves fresh eggs and cooking the cream mixture to a very soft custard stage before freezing it. It adds a depth and richness that uncooked ice cream just cannot duplicate. My mom always adds in different fruits like peach, blueberry, blackberry or even fresh coconut but I like those but my favorite is just pure vanilla bean. Here's a recipe in honor of Memaw (1915-2009) and my Grandma (1915-1996), I know there are plenty of ice cream scoops in the great beyond! Their ice cream socials live on in our hearts!